An Enclave of Trust. Your Own Private Platform. 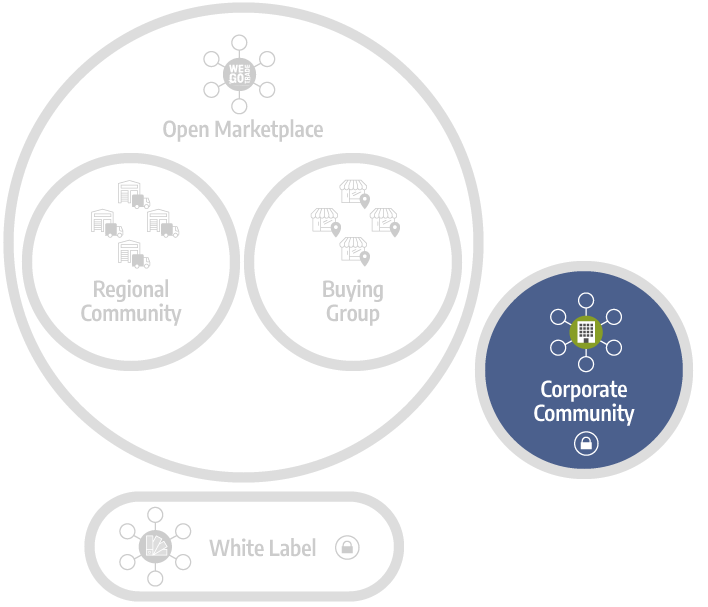 WEGOTRADE Corporate Communities are private and separate from the Open Marketplace. They are designed around the needs of company owners, corporations, franchisors or head offices who manage multiple retail locations. The Corporate Community allows them to offer a private, simplified ordering platform to their retailers. They can save precious time and money thanks to a streamlined purchasing process. This solutions does not require you to make complex ecommerce or IT developments either. As a community manager, you have full control over the products offering. Whether retailers purchase from your central warehouse or from other vendors that deliver them directly. In other words, you may opt to only offer products available from your warehouse, or you can also allow other vendors to offer their products as well. The retailers do not have access to the Open Marketplace, to other products, or other vendors through WEGOTRADE. The Corporate Communities enable measurable improvements to the entire purchasing process and experience. Unlike on the Open Marketplace, your franchisees or retailers can only order from retailers you allow. Besides, our solution offers community managers more tools, such as detailed reports and individual store or product statistics, to gain a better understanding of the purchasing habits of their members. You will also be able to oversee the entire purchasing process and observe in real-time the orders being placed on the platform. WEGOTRADE can fully integrate the transactions you make on our platform to your existing management system. This translates into savings of up to 50% on managements costs, for both the retailers and the corporation in charge of the community. Creating a Corporate Community on WEGOTRADE enables you to optimize the trades within your organization, and reduce your costs. You also simplify the purchasing process for your retailers, while having full control over the retailers purchases.